TCi director Prabhu Pingali set out on a 4,000 km journey across four states to conduct interviews with farmers in more than 20 locations throughout India. Here are some of his reflections about a trip to the eastern states of Odisha and Jharkhand. I am on my third week of travels through rural India. We have covered 3,500 km so far, and have conducted group discussions in 18 villages. We spent the last week driving through Odisha (formerly known as Orissa) and Jharkhand. In our group discussions, we have been exploring various issues around agriculture, nutrition, health and livelihoods of rural households. One of the topics that came up in every single discussion so far is the access to food grains through the public distribution (PDS) system. This highly subsidized food access program targeted towards the population below the poverty line has been around for at least 15 years. The merits of the PDS system are vigorously debated by politicians and academics. It has been branded as populist, inefficient and wasteful by its critics, but its supporters have argued that it is essential for ensuring adequate access to food for the poorest populations. For households below the poverty line, the PDS provides 25 kilograms of rice and/or wheat at 1 or 2 rupees per kilogram, as opposed to the market price of 15-20 rupees per kilogram. During our trip, I tried to understand the impact of the PDS system and contrary to my prior expectations, I found that the program does make a big difference to the lives of the rural poor. What surprised me was the easy access to the government outlet that supplies the rationed food grains, often within the village or less than 5 kilometers from it. Those with the required ration card (the BPL card) had no problem getting their monthly allotment of grain, although most complained that the same was not true in the case of sugar and kerosene allotments, which tended to be sporadic. We also heard of several cases where the poor did not get the BPL cards because they were somehow missed in registration surveys. 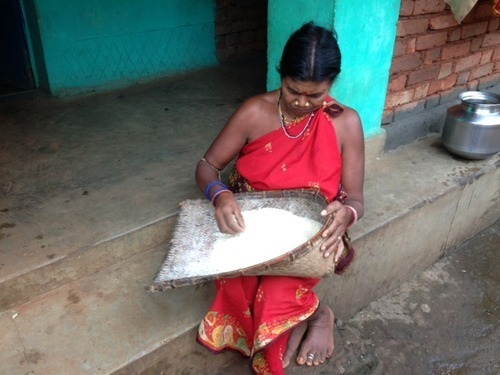 In one village in Koraput, we were told of a whole hamlet that was not registered and did not get the subsidized food grains. In the Khunti district of Jharkhand, one woman told us that the registration took place a long time ago; since then, her family had grown to 12 members as her kids got married and had kids of their own, yet they still had only one card. Despite these problems, it became clear to us that those with the cards benefit enormously from the program. The women we met consistently told us that the grain rations were sufficient to feed a family of five for two weeks. Needs during the other two weeks were being met through their own production. The rural poor, even those with land, tend to purchase grain from the market and the food subsidy reduces their monthly expenditures on food by 400-600 rupees, a major saving for these households. In our discussions, the village groups emphasized the importance of the PDS grain in helping them avert seasonal hunger. The hunger season across central and eastern India is traditionally between May and October, when the stores from the last harvest are exhausted and the next harvest is not yet in. Old people in the village who remember the time before PDS told us they don’t see that difficult period anymore. To our great surprise, areas that are inaccessible during the rainy season, such as the Melghat hills in Maharashtra, were being pre-stocked with enough supplies to last until the end of the rains. On a recent evening, we drove into Koraput District in Southern Odisha and stopped by a tribal village where subsistence rice is produced on small terraced plots. It was twilight and people were sitting in front of their houses. Women were cleaning their rice of impurities before cooking, and we asked one of them about the common complaint about the poor quality of government rice. Yes, she said, but it’s better than it used to be and it is cheap. Nutritionists have argued that the PDS program provides cheap calories but ignores legumes and pulses that provide essential micro-nutrients. In our discussions, we were told that the savings due to the PDS supplied grains are allowing poor households to purchase dal, pulses and vegetables. Moreover, access to rice rations allowed them to divert some of their rice lands to growing vegetables and other crops. The switch out of rice was most common on the more fragile hill slope lands. Economists have long argued against giving subsidized food rations, preferring cash transfers instead. I wanted to get the rural poor’s take on this argument. We were sitting with a group of women in a village just south of the border between Odisha and Jarkhand. We spent an hour talking to them about their diets and their experience with the PDS system. I asked them if they would prefer cash instead of food grains, and the group that was calm and subdued up to that point suddenly went into an uproar. No way, they said, we will never see the cash - we can control food, not cash.